The Audio-Technica AT3060 interested me when I first read about it. It's a tube mic without an accompanying power supply. Instead, it runs off of conventional phantom power. I was further intrigued because it's from Audio-Technica, which has done a great job with many of its 30 and 40 Series microphones showing great build and solid sonics. 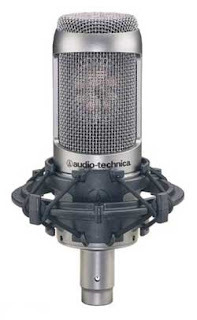 The AT3060 is a cardioid-pattern side-address large diaphragm condenser mic. It requires 48v of phantom power to spark up its Raytheon 6418 tube. You use standard issue XLR microphone cable with the AT3060. The AT3060 exudes quality in your hands and seems well built. It possesses the same silver finish as the other 30 Series microphones. The mic comes with a shockmount that reliably held the mic in any position. I used the AT3060 with several mic pres including the Grace 101, FMR RNP, Great River MP-2NV, the A Designs MP-2 and the new Millenia TD-1. It performed competently with each mic pre. What struck me the most about the AT3060 was its retro sound that came across no matter what pre was in use. I wouldn't call it a classic tube mic sound. But, I'd say it nails the retro sound sought out by so many recording artists today. If you like the White Stripes, then you'll like this mic. I don't know if it's the tube selection or the frequency plot but somehow the flavor is always there. Audio-Technica claims a frequency response of 50 Hz to 15 kHz. I found this to be fairly accurate but would say the effective high end disappears around 10 kHz. The mic seems to possess a lot of presence despite lacking on the high end. It also seems to possess a nice bit of character as well as emphasis in the low mids. In use, I liked the AT3060 first and foremost on vocals. It performed equally well with male and female voices. I found it a nice flavor for acoustic instruments and guitar amps. I'd recommend doing one of your favorite mic treatments and then adding the AT3060 as a second or third mic for flavor on acoustic instruments or guitar amps. I always found the tracks recorded with the AT3060 to be accurate sonically but retro colored. The Bottom Line: If you like the retro White Stripes sort of sound, then buy the AT3060. If you are looking for a different color for singing or talking, then you should consider this mic. If you want something to add shades of flavor here and there on instrument tracks, then you might check it out.